In this week’s edition of our Warrior of the Week series, TickPick is proud to honor Leroy Petry. 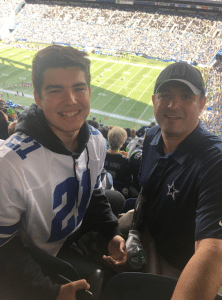 We are incredibly grateful for Leroy’s service in the Army, and honored to send him tickets to see the Seattle Seahawks play the Dallas Cowboys! Before we continue, we must give credit to Tim Kolczak with The Veterans Project for highlighting Leroy’s story. Tim does an incredible job of spotlighting our veterans’ stories, and we cannot recommend The Veterans Project enough! “Valor.” It’s a powerful word that in the dictionary reads out as, “great courage in the face of danger, especially in battle.” Still, isn’t the term “valor” just a word like any other word? Without men like the one featured in this particular blog, the word is just loose letters put together meant to define something that’s truly indefinable. We, as humans, try to expound upon certain ideas and create context around specific actions. I consider myself a wordsmith, but there are times where I truly can’t find the terminology to properly illicit the emotional response deserved for certain actions. All that being said, I hope that through the blog’s construct of imagery connected to those words, I can paint the portrait of beautiful truth in connection to Master Sergeant Leroy Petry’s actions that day. 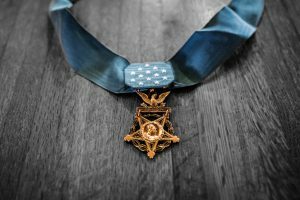 I could recite to you the history of the Medal of Honor, instead I feel that it’s most fitting to tell you that it’s the pinnacle of soldiering. There is no greater achievement possible in the face of almost certain death. Most men have died as a part of the achievement, which leaves it as an accomplishment very few can claim. Have you ever been in the presence of a giant? Do you know that feeling? Physically, Petry isn’t exactly distinguishable from the next man, except for the lack of his right arm at the elbow. You wouldn’t be able to pick him out in a room as the, “Medal of Honor recipient.” Still, I’d have known it was Petry within a few moments of meeting him. I spent a few days with him at an event put on by Warrior Rising, a company dedicated to helping veterans see success in business. Petry is the perfect spokesman for such an initiative. As I watched him interact with the Minnesota Vikings players, staff, and VIPs hosted by Warrior Rising, I saw the very definition of selfless-service. He was constantly about others in that space and making sure everyone else was taken care of. There are individuals that distinguish themselves by their actions in every facet of life. That’s Petry… and that’s what a Medal of Honor recipient looks like. I’ve heard many of the recipients play down their actions as, “being in the right place at the right time” or “being in the right place at the wrong time” depending on how you look at it. It’s hard to imagine someone committing such a selfless act only to downplay it in that way, but it’s truthfully the way they see their own deed. Here’s MSG Petry.